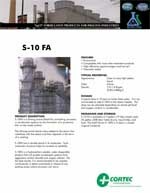 Description: S-10FA is a filming amine blend for controlling corrosion in condensate systems by the formation of a protective film on the metal surface.This filming amine blend when added to the steam line volatilizes with the steam and then deposits in the form of a coating. Package: S-10 FA is available in 5 gallon (19 liter) plastic pails, 55 gallon (208 liter) metal drums, liquid totes, and bulk. The shelf life for S-10FA is 2 years in closed original container. FEATURED IN: Cortec S-10 FA Featured in Food Engineering Magazine! FEATURED IN: Corrosion Control Film Featured in Water World Magazine! FEATURED IN: Cortec S10-FA Featured in Power Engineering Magazine! FEATURED IN: Cortec S10-FA Featured in Water World Magazine! FEATURED IN: Corrosion Inhibitor Featured in Coatings Tech Digital! FEATURED IN: Cortec Introduces S-10 FA Featured in Coatings Pro Magazine! PRODUCT RELEASE: Cortec® Introduces S-10 FA: You Won't "Boil" Over With VpCI® Corrosion Protection!